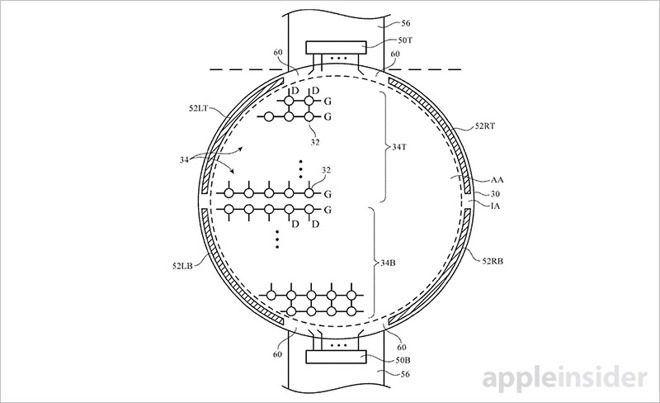 A pair of Apple patent filings published Thursday reveal ongoing research into circular displays suitable for wearable devices, suggesting the company was at least mulling the creation of a round-faced Apple Watch. According to two patent applications (1, 2) published by the U.S. Patent and Trademark Office, both titled "Electronic device having display with curved edges," Apple was actively investigating non-rectangular device displays as recently as January of this year. More specifically, the documents' claims outline driver technology and other contingencies for powering a circular display. 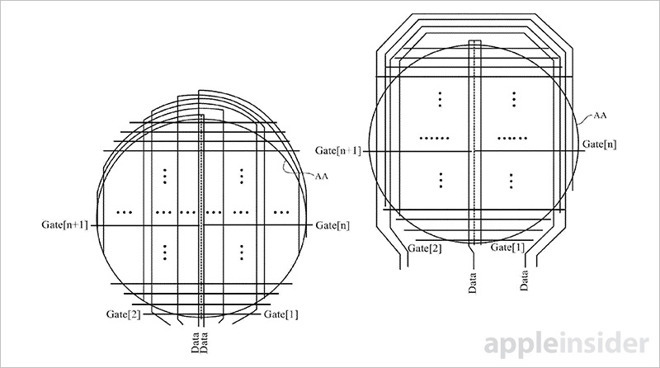 Apple's proposed solution for circular display technology is fairly straightforward and borrows a general architecture from traditional rectangular displays. In some embodiments, the display sits in a housing surrounded by an inactive border region where driver circuitry, interconnect lines and other supporting hardware are hidden. Like displays deployed in iPhone, iPad and Apple Watch, the proposed circular model would incorporate an array of pixels arranged in columns and rows. To accommodate an overall circular shape with least four curved edges, pixel columns and rows in the proposed panel may have different lengths. The length of gate driver circuitry, or gate lines, are likewise of staggered length depending on their placement within the display architecture. Unlike common displays, Apple proposes folding data lines back on themselves, causing them to pass through two or more pixel columns and in some cases overlap. This arrangement saves space and reduces crowding, while at the same time addressing all pixels in the active area. Considering Apple has committed to a rectangular display and chassis design with Apple Watch, it is unlikely that the company will debut a circular variant in the near future. It is interesting, however, to see evidence of research into potential design variations. While the first smartwatch devices featured what amounted to shrunken down smartphone displays, manufacturers later dabbled with circular or semi-circular designs to set their product apart from a raft of nearly identical hardware. Of note, Motorola was one of the first to bring a circular panel (minus a crescent-shaped cutout for display circuitry) to market with the Moto 360, which was followed by current devices like Samsung's Gear S2 and S3, and LG's Watch Urbane series. 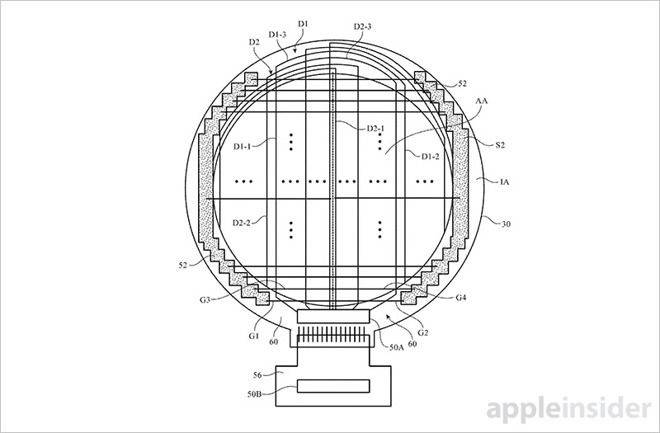 The first of Apple's circular watch display patent applications was filed for in December 2015 and credits Chin-Wei Lin, Zhen Zhang, Shih Chang Chang and Sang Ha Kim as its inventors. A revised application filed in January 2016 credits Yu Cheng Chen, Tsung-Ting Tsai and Shih Chang Chang as inventors.